Ruminations: SCOTUS vs. POTUS... etc. In her decision, U.S. District Judge Anna Brown doesn't rule that the no-fly list itself violates the Constitution, but that it's unconstitutional because it denies due process. Basically, if you're on that list you have no recourse. You don't get to face your accuser. It's all punishment and no proof. In her ruling [PDF], Brown states, "The court concludes international travel is not a mere convenience or luxury in this modern world. Indeed, for many international travel is a necessary aspect of liberties sacred to members of a free society." She goes on to write, "Accordingly, on this record the court concludes plaintiffs inclusion on the no-fly list constitutes a significant deprivation of their liberty interests in international travel." In so ruling, Brown opines on the law's violation of the rights of due process as stated in the Fifth and Fourteenth Amendments. I think the more interesting argument is the one that isn't made, and is rarely, if ever, made in recent years. In this ruling it's simply accepted and assumed that we have a right to travel, something that's not listed in the Constitution. Does such a right exist? Well, think about it for a moment and I think you'll find yourself asking, "how could it not?" It's a tiny amendment, but one that in all good sense we should be brandishing like a stick. There's a funny thing about "rights". They are absolutely, categorically not granted to you by the Constitution, or by the Court, or Congress, or the President, or by any human authority. Rather, these rights are affirmed and acknowledged by the Constitution. And that acknowledgement of the affirmation of the extra-constitutional source of rights is stated here, in the Ninth Amendment. The right to travel is common sense. When denied to the extreme, it's synonymous with imprisonment. That's no less true when the jail is spacious. The government argued that while you have a right to travel, you don't have a right to travel by any particular conveyance. So instead of flying to Europe you could take a steamer, or your yacht, or drive on the Arctic ice, or swim, or get Scotty to beam you over. Imagine being told that you're not actually imprisoned because you can always climb the high wall, avoid the dogs, and slip through the razor wire... you're just inconvenienced. Mostly the government means "travel by boat", but the argument is exactly as stupid as I'm portraying it. In today's world, with today's economics, conveyance by aircraft is the only practical option for international travel. The judge, to her credit, noticed. 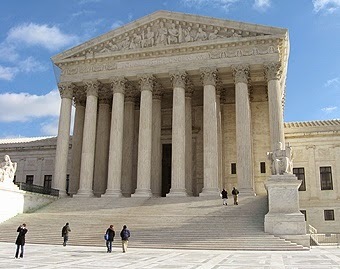 Although the Court holds Defendants must provide a new process that satisfies the constitutional requirements for due process, the Court concludes Defendants (and not the Court) must fashion new procedures that provide Plaintiffs with the requisite due process described herein without jeopardizing national security. Because due process requires Defendants to provide Plaintiffs (who have all been denied boarding flights and who have submitted DHS TRIP inquiries without success) with notice regarding their status on the No-Fly List and the reasons for placement on that List, it follows that such notice must be reasonably calculated to permit each Plaintiff to submit evidence relevant to the reasons for their respective inclusions on the No-Fly List. In addition, Defendants must include any responsive evidence that Plaintiffs submit in the record to be considered at both the administrative and judicial stages of review. In other words, Eric Holder has to come up with procedures that allow individuals to be aware of the their no-fly status and the reasons for it, and to allow them to appeal. His deadline for presenting these new procedures is July 14th, 2014. On MONDAY the SCOTUS ruled [PDF] that agencies do not have the freedom to "tailor" laws and regulations in ways not authorized by Congress. In this case it's the EPA's definition of "pollution" as being "any airborne substance", which taken literally could include clouds. It remains to be seen if the SCOTUS will remember this decision when someone pulls Obama's unilateral changes to Obamacare back into court. But I'm close to 100% certain that the plaintiffs will, and will argue it forcefully. On WEDNESDAY the SCOTUS ruled [PDF] that police need a warrant to search a cell phone. This is such an obvious decision based in the unambiguous clear language of the Fourth Amendment that it's astoundingly perplexing that it got as far as the Supreme Court. If you see an exemption for cell phones there, you probably also see pink elephants, ghosts, and leprechauns. On THURSDAY, the SCOTUS unanimously struck down three of Obama's appointments to the National Labor Relations Board [PDF]. Obama had made what he called "recess appointments". The Court ruled that a three-day break doesn't put the Congress "in recess". And rightly so, otherwise "King Potus" would be issuing decrees every weekend. What it really means is that Martha Waltz has no idea what the word "essentially" means, because in no way is that what the Court is saying. Read the ruling yourself. I linked the PDF above. The Massachusetts law was passed in response to the fatal shootings of two staff members at abortion clinics in Brookline in 1994. This was a sad event. However, murder is already illegal... unless you're an abortionist... and the Massachusetts law does absolutely nothing to prevent a repeat of the event. A person who is willing to commit murder is not going to be held magically at bay by an imaginary impenetrable force-field erected by public sentiment. Even if he were, how long do you think it would take a bullet to traverse the 35-foot distance? The law is plainly ineffective for its stated purpose. What the law effectively does is the source of the plaintiff's complaint. It prevents peaceful, law-abiding people from having one-on-one conversations with people about alternatives that don't include killing a baby. "Americans have the freedom to talk to whomever they please on public sidewalks. That includes peaceful pro-lifers like Eleanor McCullen, who just wants to offer information and help to women who would like it. The Supreme Court has affirmed a critical freedom that has been an essential part of American life since the nation's founding." Overall, very well said (as usual). Best line of all? "murder is already illegal... unless you're an abortionist"
How do you feel about someone that chooses not to vote? How I feel about them depends largely on why they chose not to vote. If they chose not to vote because they have no preference (all choices are equally good or bad to them) I can respect that. If they vote on some races, but chose not to vote on another specific race because they feel uninformed about the candidates and/or issues and have a conscious desire not to pollute the informed vote, then I wish they had taken the time to learn the issues, but respect that their decision to abstain is better than random pointing. If they didn't vote at all, not by conscious choice, but rather out of laziness or apathy, I don't think highly of them. I should point out that I have no reason to ask them whether they voted or not, nor for whom, nor their reasons for voting or abstaining. So my feelings on the matter are purely at the whim of their unsolicited volunteering of the information.